The Hotel Villa Igea is now an annex of the four-star Hotel Savoia & Jolanda, which is a few meters away on the waterfront. 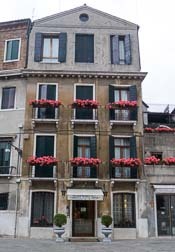 The 27-room building faces the Campo San Zaccaria, a pleasant square with one of Venice's prettiest church façades. As you leave the Alilaguna Linea Blu waterbus pier, head left and look for a covered passage just before the Hotel Savoia & Jolanda. The passage is called the "Sotoportego S. Zaccaria," and you'll see signs for the Ospedale (hospital) and the Carabinieri (police) above the opening. Go through the passage, which will lead you into Campo San Zaccaria. Take the Alilaguna Blue Line airport boat from the cruise basin to the San Zaccaria stop. Leave the cruise terminal by the main doors and walk to the wooden bridge. Cross the bridge and walk to the vaporetto stop, which is just ahead. Take the No. 2 water bus in the direction of San Zaccaria. Get off at San Zaccaria and follow the directions above.